Altitude range: (1,900? )2,100-2,500 metres above sea level. Habitat and Ecology: This species grows on rocky outcrops in inter-Andean valleys together with Sulcorebutia vizcarrae. The main threat is land use change due to both small holder and medium scale agriculture. However this cactus grows on rocky outcrops and this confers it some protection as these are left intact in arable lands, but the subpopulations are probably affect by goats, even though this poses a minor threat and too, cactus are considered by locals nothing else than stinging weeds that had to be eliminated. The hills where Parodia hausteiniana grows are often burned over (a common practice in all of Latin America). After fire the plants look like small burned cucumbers while deprived of their spines, those burned plants later start growing again and readily produce their extraordinarily beautiful spines. 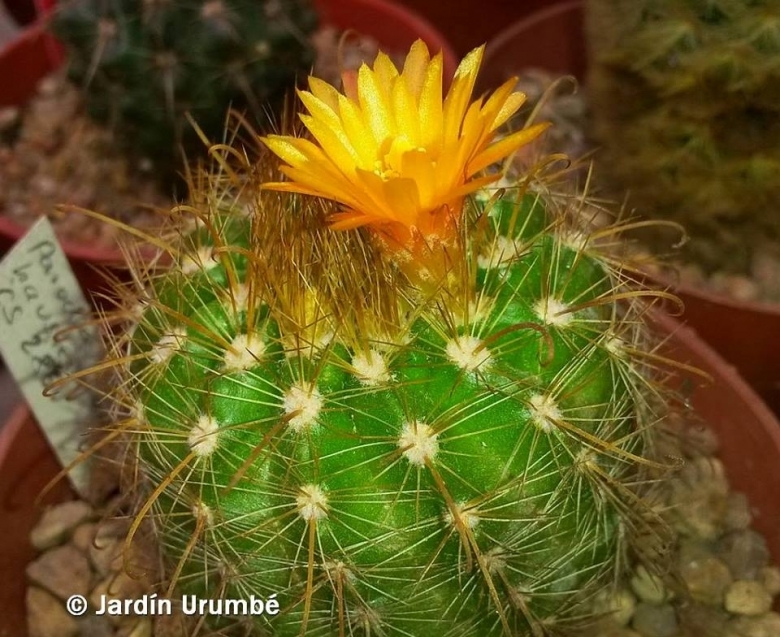 Description: Parodia hausteiniana is a small growing, solitary cactus to only 5 cm in diameter with tiny yellow or orange flower. It is remarkable for its thick, yellow or amber-coloured spines. Stem: Unbranched, light green, globose to short cylindrical, to 5 cm in diameter. Ribs: About 13, slightly twisted. Areoles: Round to elliptical with white wool. Central spines: 4, forming a cross, stout, yellow, hooked, to 13 mm long. Radial spines: 26-30, thin, radiating, flattened against the stem surface, yellow, becoming whitish with age, to 8(-10) mm long. Flowers: Yellow, occasionally orange, to 10 mm long and in diameter; pericarpels and floral tubes with scales and bristles. Fruits: Egg-shaped, olive green, 3-4 mm long. Seeds: Dark brown, finely tuberculate. Parodia hausteiniana Rausch: is a small growing, solitary cactus to only 5 cm in diameter with yellow or amber-coloured spines. Flowers are yellow or orange. Distribution: Cochabamba near Mizque. Bolivia. Parodia laui F.H.Brandt: it is almost identical to P. hausteiniana but has orange-red blooms. Distribution: Campero (road from Cruce to Ascientos), near Mizque, Cochabamba, Bolivia. 7) Lowry, M. 2013. “Parodia hausteiniana.” The IUCN Red List of Threatened Species. Version 2014.3. <www.iucnredlist.org>. Downloaded on 27 December 2014. Cultivation and Propagation: Parodia hausteiniana comes from mountainous areas, and in its natural habitat, warm rain falls and waters the plants, and in the winter, the it endures long, dry, and temperate zone conditions. It would be wise and fun to duplicate the plant's natural growing conditions and watch it mature into a healthy potplant. It has delightful flowers and the plant remains compact. It is easy to cultivate and recommended for beginners. Warning the central spines end with a hook and on occasion cling to curtains or clothing. If you accidentally pull the plant out of the pot, you should put it back in its place and not watered for 2 weeks. Growth rate: It is a slow growing but easily flowering species. This species start blooming when only 2.5 cm in height. Soils: This species is easy to cultivate in a very open mineral mix with at least 50% sand or pumice grit. Repotting: It is a small container size plants and prefers deep pots and good drainage to accommodate its roots, but it is rot prone, because of the sensitivity to excess of watering. It will occupy a small pot comfortably, and eventually remains a manageable sized house plant. It is better that it is repotted regularly. Repotting will increase the number of flowers produced. Re-pot yearly until it reaches about 5 cm in size, then every two or three years will suffice. Repotting is best done at the end of winter, but can be done at other times, too. Do not water for a couple of weeks after re-potting, to reduce risk of root rot via broken roots. A layer of 'pea' gravel at the bottom of the pot improves drainage. A layer of decorative gravel as a top dressing helps prevent the caking of the potting mix, which decreases the rate of water absorption. It also keeps the perlite and pumice from blowing everywhere, and looks nice. Watering: It requires full sun or light shade and careful watering to keep the plant compact, and maintain strong and dense spines and allow the pot to dry out between waterings. Keep dry in winter at a minimum temperature of 0°C. It tends to rot if too wet. The plants can be placed outdoors in April, if protected from torrential rain and hail and direct sunlight. Water them thoroughly when placed out, and again in two weeks, and again in one week. After one month the plants are ready to be placed out in full sun and full rain for the summer. During dry spells the collection is watered once a week, during hot dry spells, twice a week. Hardiness: It is reputedly resistant to frost if kept on the dry side prior to, and during, cold weather and requires a winter rest period (hardy to -5° C, or less for short periods). It grows in nature at high altitudes, and does not thrive well at high temperatures in cultivation. It will often go dormant in mid-summer, and resume growth again when the weather cools in late August. It is generally accepted that plants kept at too high a temperature, or watered too much during the winter rest period, will not bloom the following year. Exposition: The plant tolerates extremely bright situations but enjoys filtered sunlight or afternoon shade, inside it needs bright light, and some direct sun. Tends to stay compact in strong light, which encourages flowering and heavy spine production, but is likely to suffer from sun scorch or stunted growth if over exposed to direct sunlight during the hottest part of the day in summer. Uses: It is a fine plant for a rock garden or container. This variety is also likely to flower as a house plant, but results will depend on a variety of growing conditions. Rot: It is especially prone to root rot, therefore, underpot in a smaller container filled with very porous compost. However rot it is only a minor problem with parodias if the plants are watered and “aired” correctly. If they are not, fungicides won't help all that much. Propagation: To propagate, use only seed, but the process is difficult because it is slow. Seeds germinate in 7-14 days at 21-27° C in spring or summer remove gradually the glass cover as soon the plants will be well rooted (ca 1-2 weeks) and keep ventilated, no full sun for young plants! The seedlings should not be disturbed until they are well rooted, after which they can be planted separately in small pots.